The browsers on laptop don't load websites and the Internet Explorer Proxy Server doesn't change from 127.0.0.1:52830 .We scanned the files with Malwarebytes, AdwCleaner and quarantined the malwares and deleted them ; but it didn't work. Microsoft Software Removal Tool didn't run and Junkware Removal Tool showed "checking for updates" but it didn't start the scan. I have attached the logs here. Thanks in advance. This fix will include removing temp files and emptying the Recycle Bin. Download attached **fixlist.txt** and save it to same location where the FRST tool is located. NOTE: Both FRST.exe and the fixlist.txt must be in the same location or the fix will not work. Close all browsers before running. Double click FRST to run the tool. If the tool warns you the version is outdated, please download and run the updated version. •If you receive a message that a reboot is required, please make sure you allow it to restart normally. •The tool will complete its run after restart. When finished, the tool will make a log (Fixlog.txt) in the same location from where it was run. Please attach the Fixlog.txt in your reply. Restart the pc and let me know how it's running now. Thanks for your help and I'm sorry for late reply. FRST worked and proxy is changed now but browsers can't load websites sometimes and show the message that the website didn't send any data or took too long to respond but the websites don't have any problem and load on other devices. I attached the Fixlog.txt file. Sorry for late reply again. The owner of laptop was in a trip for a few days and we did the scan which you mentioned above. That didn't provide the logs I need. What issues are you still seeing? Browsers doesn't load websites sometimes. Sometimes they load but it's slow. And there are script errors , too. 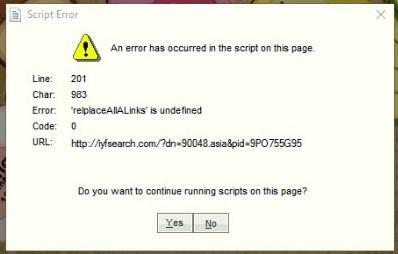 I attached the screenshot of error. I looked in the extensions of browsers but I didn't find anything related to iyfsearch or maybe I didn't recognize them. Go to the menu icon in the top right of Google Chrome. Scroll to the bottom and click "Advanced Settings"
The second to last section at the bottom will be "System"
Uncheck the box that says "Use Hardware Acceleration When Available"
Restart Chrome and you will be good to go. I tried it but it didn't fix the isuue. Sorry for not replying sooner but I'm dealing with the flu. Sorry i don't have any other suggestions on what's causing this issue. I hope you feel well by now. Thanks for your help. Sorry for the delay. If you still need help with this please let me know.